"Color spectrum" redirects here. For The Dear Hunter album, see The Color Spectrum. White light is dispersed by a prism into the colors of the visible spectrum. The visible spectrum is the portion of the electromagnetic spectrum that is visible to the human eye. Electromagnetic radiation in this range of wavelengths is called visible light or simply light. A typical human eye will respond to wavelengths from about 380 to 740 nanometers. In terms of frequency, this corresponds to a band in the vicinity of 430–770 THz. The spectrum does not contain all the colors that the human eyes and brain can distinguish. Unsaturated colors such as pink, or purple variations like magenta, for example, are absent because they can only be made from a mix of multiple wavelengths. Colors containing only one wavelength are also called pure colors or spectral colors. Visible wavelengths pass largely unattenuated through the Earth's atmosphere via the "optical window" region of the electromagnetic spectrum. An example of this phenomenon is when clean air scatters blue light more than red light, and so the midday sky appears blue. The optical window is also referred to as the "visible window" because it overlaps the human visible response spectrum. The near infrared (NIR) window lies just out of the human vision, as well as the medium wavelength infrared (MWIR) window, and the long wavelength or far infrared (LWIR or FIR) window, although other animals may experience them. 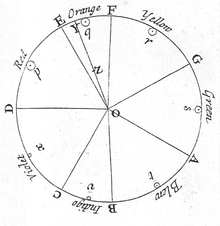 Newton's color circle, from Opticks of 1704, showing the colors he associated with musical notes. The spectral colors from red to violet are divided by the notes of the musical scale, starting at D. The circle completes a full octave, from D to D. Newton's circle places red, at one end of the spectrum, next to violet, at the other. This reflects the fact that non-spectral purple colors are observed when red and violet light are mixed. In the 13th century, Roger Bacon theorized that rainbows were produced by a similar process to the passage of light through glass or crystal. In the 17th century, Isaac Newton discovered that prisms could disassemble and reassemble white light, and described the phenomenon in his book Opticks. He was the first to use the word spectrum (Latin for "appearance" or "apparition") in this sense in print in 1671 in describing his experiments in optics. 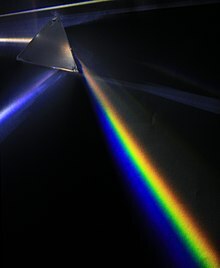 Newton observed that, when a narrow beam of sunlight strikes the face of a glass prism at an angle, some is reflected and some of the beam passes into and through the glass, emerging as different-colored bands. Newton hypothesized light to be made up of "corpuscles" (particles) of different colors, with the different colors of light moving at different speeds in transparent matter, red light moving more quickly than violet in glass. The result is that red light is bent (refracted) less sharply than violet as it passes through the prism, creating a spectrum of colors. Newton originally divided the spectrum into six named colors: red, orange, yellow, green, blue, and violet. He later added indigo as the seventh color since he believed that seven was a perfect number as derived from the ancient Greek sophists, of there being a connection between the colors, the musical notes, the known objects in the solar system, and the days of the week. The human eye is relatively insensitive to indigo's frequencies, and some people who have otherwise-good vision cannot distinguish indigo from blue and violet. For this reason, some later commentators, including Isaac Asimov, have suggested that indigo should not be regarded as a color in its own right but merely as a shade of blue or violet. Evidence indicates that what Newton meant by "indigo" and "blue" does not correspond to the modern meanings of those color words. Comparing Newton's observation of prismatic colors to a color image of the visible light spectrum shows that "indigo" corresponds to what is today called blue, whereas "blue" corresponds to cyan. In the 18th century, Johann Wolfgang von Goethe wrote about optical spectra in his Theory of Colours. Goethe used the word spectrum (Spektrum) to designate a ghostly optical afterimage, as did Schopenhauer in On Vision and Colors. Goethe argued that the continuous spectrum was a compound phenomenon. Where Newton narrowed the beam of light to isolate the phenomenon, Goethe observed that a wider aperture produces not a spectrum but rather reddish-yellow and blue-cyan edges with white between them. The spectrum appears only when these edges are close enough to overlap. In the early 19th century, the concept of the visible spectrum became more definite, as light outside the visible range was discovered and characterized by William Herschel (infrared) and Johann Wilhelm Ritter (ultraviolet), Thomas Young, Thomas Johann Seebeck, and others. Young was the first to measure the wavelengths of different colors of light, in 1802. The connection between the visible spectrum and color vision was explored by Thomas Young and Hermann von Helmholtz in the early 19th century. Their theory of color vision correctly proposed that the eye uses three distinct receptors to perceive color. Colors that can be produced by visible light of a narrow band of wavelengths (monochromatic light) are called pure spectral colors. The various color ranges indicated in the illustration are an approximation: The spectrum is continuous, with no clear boundaries between one color and the next. A rendering of the visible spectrum on a gray background produces non-spectral mixtures of pure spectrum with gray, which fit into the sRGB color space. Color displays (e.g. computer monitors and televisions) cannot reproduce all colors discernible by a human eye. Colors outside the color gamut of the device, such as most spectral colors, can only be approximated. For color-accurate reproduction, a spectrum can be projected onto a uniform gray field. The resulting mixed colors can have all their R, G, B coordinates non-negative, and so can be reproduced without distortion. This accurately simulates looking at a spectrum on a gray background. Spectroscopy is the study of objects based on the spectrum of color they emit, absorb or reflect. Spectroscopy is an important investigative tool in astronomy, where scientists use it to analyze the properties of distant objects. Typically, astronomical spectroscopy uses high-dispersion diffraction gratings to observe spectra at very high spectral resolutions. Helium was first detected by analysis of the spectrum of the sun. Chemical elements can be detected in astronomical objects by emission lines and absorption lines. The shifting of spectral lines can be used to measure the Doppler shift (red shift or blue shift) of distant objects. Wikimedia Commons has media related to Visible spectrum. ^ Starr, Cecie (2005). Biology: Concepts and Applications. Thomson Brooks/Cole. ISBN 978-0-534-46226-0. ^ Coffey, Peter (1912). The Science of Logic: An Inquiry Into the Principles of Accurate Thought. Longmans. ^ Isacoff, Stuart (16 January 2009). Temperament: How Music Became a Battleground for the Great Minds of Western Civilization. Knopf Doubleday Publishing Group. pp. 12–13. ISBN 978-0-307-56051-3. Retrieved 18 March 2014. ^ Asimov, Isaac (1975). Eyes on the universe : a history of the telescope. Boston: Houghton Mifflin. p. 59. ISBN 978-0-395-20716-1. ^ Evans, Ralph M. (1974). The perception of color (null ed.). New York: Wiley-Interscience. ISBN 978-0-471-24785-2. ^ McLaren, K. (March 2007). "Newton's indigo". Color Research & Application. 10 (4): 225–229. doi:10.1002/col.5080100411. ^ Waldman, Gary (2002). Introduction to light : the physics of light, vision, and color (Dover ed.). Mineola: Dover Publications. p. 193. ISBN 978-0-486-42118-6. ^ John C. D. Brand (1995). Lines of light: the sources of dispersive spectroscopy, 1800–1930. CRC Press. pp. 30–32. ISBN 978-2-88449-163-1. ^ Cuthill, Innes C (1997). "Ultraviolet vision in birds". In Peter J.B. Slater. Advances in the Study of Behavior. 29. Oxford, England: Academic Press. p. 161. ISBN 978-0-12-004529-7. ^ Jamieson, Barrie G. M. (2007). Reproductive Biology and Phylogeny of Birds. Charlottesville VA: University of Virginia. p. 128. ISBN 978-1-57808-386-2. ^ Skorupski, Peter; Chittka, Lars (10 August 2010). "Photoreceptor Spectral Sensitivity in the Bumblebee, Bombus impatiens (Hymenoptera: Apidae)". PLoS ONE. 5 (8): e12049. Bibcode:2010PLoSO...512049S. doi:10.1371/journal.pone.0012049. PMC 2919406. PMID 20711523. ^ "True or False? "The common goldfish is the only animal that can see both infra-red and ultra-violet light."". Skeptive. 2013. Archived from the original on December 24, 2013. Retrieved September 28, 2013. ^ Neumeyer, Christa (2012). "Chapter 2: Color Vision in Goldfish and Other Vertebrates". In Lazareva, Olga; Shimizu, Toru; Wasserman, Edward. How Animals See the World: Comparative Behavior, Biology, and Evolution of Vision. Oxford Scholarship Online. ISBN 978-0-19-533465-4. ^ Kasparson, A. A; Badridze, J; Maximov, V. V (2013). "Colour cues proved to be more informative for dogs than brightness". Proceedings of the Royal Society B: Biological Sciences. 280 (1766): 20131356. doi:10.1098/rspb.2013.1356. PMC 3730601. PMID 23864600. ^ Newman, EA; Hartline, PH (1981). "Integration of visual and infrared information in bimodal neurons in the rattlesnake optic tectum". Science. 213 (4509): 789–91. Bibcode:1981Sci...213..789N. doi:10.1126/science.7256281. PMC 2693128. PMID 7256281. ^ Kardong, KV; Mackessy, SP (1991). "The strike behavior of a congenitally blind rattlesnake". Journal of Herpetology. 25 (2): 208–211. doi:10.2307/1564650. JSTOR 1564650. ^ Fang, Janet (14 March 2010). "Snake infrared detection unravelled". Nature News. doi:10.1038/news.2010.122. ^ Krochmal, Aaron R.; George S. Bakken; Travis J. LaDuc (15 November 2004). "Heat in evolution's kitchen: evolutionary perspectives on the functions and origin of the facial pit of pitvipers (Viperidae: Crotalinae)". Journal of Experimental Biology. 207 (Pt 24): 4231–4238. doi:10.1242/jeb.01278. PMID 15531644. ^ Greene HW. (1992). "The ecological and behavioral context for pitviper evolution", in Campbell JA, Brodie ED Jr. Biology of the Pitvipers. Texas: Selva. ISBN 0-9630537-0-1. ^ "Reproducing Visible Spectra". RepairFAQ.org. Retrieved 2011-02-09.